Surface examinations of the Skagen artists’ paintings reveal that the seaside colony embraced artistic experimentation. Skagens Museum curator Mette Bøgh Jensen illuminated the cutting-edge practices of the Skagen artists in her gallery talk about A World Apart. A cornerstone painting in the exhibition, Michael and Anna Ancher’s collaborative Judgment of a day’s work symbolizes the mutual respect between the husband and wife as artists. Anna painted Michael’s portrait, and he painted hers as well as the remainder of the composition. 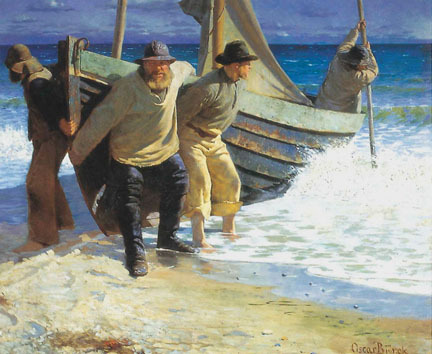 Conservators also found tiny grains of sand within the surface of Skagen artists’ paintings. Skagen attracted artists who wanted to paint en plein air, or outdoors, directly in front of their subjects. One of the most modern phenomena of the day, this method enabled artists to capture the natural light and color of their surroundings. No minor feat, large canvases were challenging to transport. Painting outside also exposed artists to the unpredictable and unstable elements of nature. P.S. Krøyer’s works, in particular, have undergone considerable inspection. Based on sand dispersal and concentration, conservators can conjecture whether works were completed on the beach or in his studio. Several of Krøyer’s monumental beach paintings, including a portrait of his wife, Marie, and his Fishermen haul dragnets at Skagen’s Northern Beach, are showcased in the exhibition. Who knows what other concrete information may be unearthed about these Skagen artists? This entry was posted in NMWA Exhibitions by Women in the arts. Bookmark the permalink. This is a very interesting article. Would be interested in learning more about this book.